Focusing on emotional shifts in childhood ideals and practices over the past two centuries, this chapter seeks to understand child subjecthood, the instrumentalization of children’s emotions for religious or ideological ends, and children’s importance as agents of change. Because of their assumed malleability, young people were often at the heart of social anxieties and debates about the future of nations and empires. The interrelation of authority figures’ understanding of childhood and children’s own experiences is a principal focus of this book. 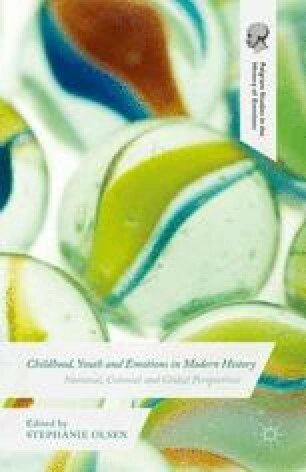 In this chapter, we explore novel ways to approach the history of childhood and the emotions more broadly by laying out a framework for how to understand these fields in global terms, using the concepts of emotional formations, emotional frontiers and the sentimental/innocent child. Reflecting on the scholarship represented in this volume, which covers a diversity of national and transnational contexts, and bringing to bear our own experience in global histories of childhood and of the emotions, we hope to capitalize on an unprecedented opportunity to start thinking globally about the politics of childhood.